How does a river plume influence hurricanes in the Caribbean? A report by Barbara Gutierrez for the University of Miami. The answer is more complex than thought, an award-winning dissertation by a UM graduate student shows. With Hurricane Florence rapidly intensifying as it barrels its way toward the East Coast, a recent Ph.D. graduate of the University of Miami’s Rosenstiel School of Marine and Atmospheric Science has uncovered new evidence of how ocean waters impact storms. In her study, Johna E. Rudzin, who has devoted much of her career research to the effect ocean currents have on hurricane intensification, examines the role that a seldom-studied freshwater plume plays in strengthening a hurricane. Her dissertation, An Assessment of the Caribbean Sea’s Upper Ocean Influence on Air-Sea Interaction During Tropical Cyclones, is a recent winner of the Barrett Prize by UM’s Miami Institute for Advanced Study of the Americas. She is currently a postdoctoral fellow at the U.S. Naval Research Lab in Monterey, California, under a fellowship that was awarded by the National Research Council through its Research Associateship Program. While there, she hopes to show the importance that ocean observations play on improving a hurricane intensity forecast using the Navy’s coupled hurricane model. What were you looking for in this research? The Caribbean Sea is full of complex ocean structures, such as the Amazon-Orinoco River plume, and large warm ocean features known as warm core eddies that form in ocean regions such as the Gulf of Mexico and are known to provide a positive feedback to hurricane intensity. Through my investigation, I found that several storms that have passed over the Caribbean Sea have become very intense, so I was interested to see if the ocean played a role in their rapid intensification, which occurred especially after they passed over the Amazon-Orinoco River plume. In literature, this plume was believed to provide a positive feedback to tropical cyclones such that it would reduce the amount of sea surface temperature cooling during storm passage and provide sufficient heat to help the storm intensify. There are some studies that showed how the ocean responded during hurricane passage, but none really investigated how the ocean response influenced the transfer of heat in a hurricane, which was the goal of my dissertation. Can you describe the Amazon-Orinoco Plume and the role it plays on the waters of the Caribbean? The Amazon-Orinoco River plume is a freshwater plume, the combination of two river runoff sources—the Amazon River and the Orinoco River. The Amazon River is located in the northeast portion of South America and has a maximum river discharge around June. This river discharge is carried northward along the continent by the North Brazil Current and can spill out on the eastern side of the Lesser Antilles and/or be brought into the Caribbean Sea via ocean eddies known as North Brazil Current rings. The Amazon-Orinoco River plume. The colors show the plume using satellite sea surface salinity data from the Soil Moisture and Ocean Salinity satellite mission. The Orinoco River discharges right into the Caribbean Sea in Venezuela, just north of Guyana. The Amazon River discharge eventually makes its way into the Caribbean Sea at the time of the maximum discharge of the Orinoco River and makes the Amazon-Orinoco River plume cover its maximum area around September, which is the peak of Atlantic hurricane season. The plume creates a freshwater lens at the top of the ocean with saltier ocean waters below it. This creates a gradient of salinity known as stratification, which essentially reduces the efficiency of hurricane-force winds bringing cooler waters from below to the sea surface. It’s like mixing oil and vinegar. This helps to prevent dramatic sea surface temperature cooling and helps provide sufficient heat and moisture into the storm, which influences intensity. For observations of the Caribbean Sea waters during ambient (non-hurricane) conditions, I was fortunate to conduct an experiment in a National Oceanic and Atmospheric Administration (NOAA) Hurricane Hunter plane, from which I deployed 55 different aircraft expendable oceanographic probes that measure ocean temperature, salinity, and ocean current velocities. I also deployed probes that measure atmospheric temperature, moisture, and winds above the ocean surface. For analyses where I needed data inside of a hurricane, I used atmospheric probe data provided by the NOAA Hurricane Research Division. I also used a variety of satellite measurements that observe sea surface temperature, sea surface height, and sea surface salinity. This data also includes estimation of daily ocean isotherms and oceanic heat content from RSMAS’ Upper Ocean Dynamics Lab. A mixture of data, simple models, and more complex models (such as the Weather Research and Forecasting model) gave an in-depth look at how the Amazon-Orinoco plume influences the transfer of heat in tropical cyclones and how this may play a role into intensification. What does this imply for the intensity of hurricane winds? The public has a general understanding that warm sea surface temperatures help to intensify a hurricane. This occurs because the storm uses this heat as an energy source. Since the salinity gradient in the river plume helps to reduce sea surface temperature cooling, this essentially helps to provide sustained heat flux into a storm in this region and helps to intensify the storm. If this salinity feature did not exist, sea surface temperatures would cool much more dramatically and provide a negative feed back to storm intensity. Overall, the ocean component is just one part of hurricane intensity. If atmospheric conditions like high wind shear are not generally favorable for a hurricane to intensify, the ocean can only provide so much of a positive influence. What can the layperson take away from this study? 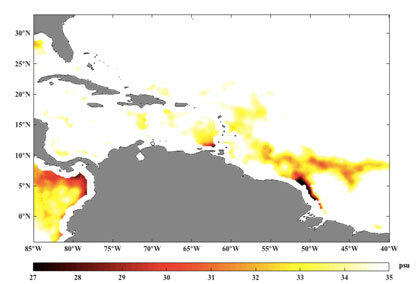 Hurricanes are definitely affected by sea surface temperatures over which they pass. Yet, sea surface temperatures during the passage of storms and the amount of heat the storm extracts from the ocean are dependent upon the type of ocean features that lay beneath the sea surface, whether it is freshwater river plumes or deep warm ocean eddies. Before my dissertation, I believe we didn’t quite give enough attention to how the Amazon-Orinoco River plume could be positively influencing air-sea interaction and intensity in hurricanes. My research adds another aspect of complexity to the study of hurricanes.